These days, most people that have a cell have a smartphone that runs on the software made by one of two major players: Android and Apple. Android is a division of Google that has a loyal group of adherents that worship the companies’ internet and information savvy mindset, while the iPhone has its own group of dedicated users that cite Apple’s user friendly and design centred mindset when it comes to its products. 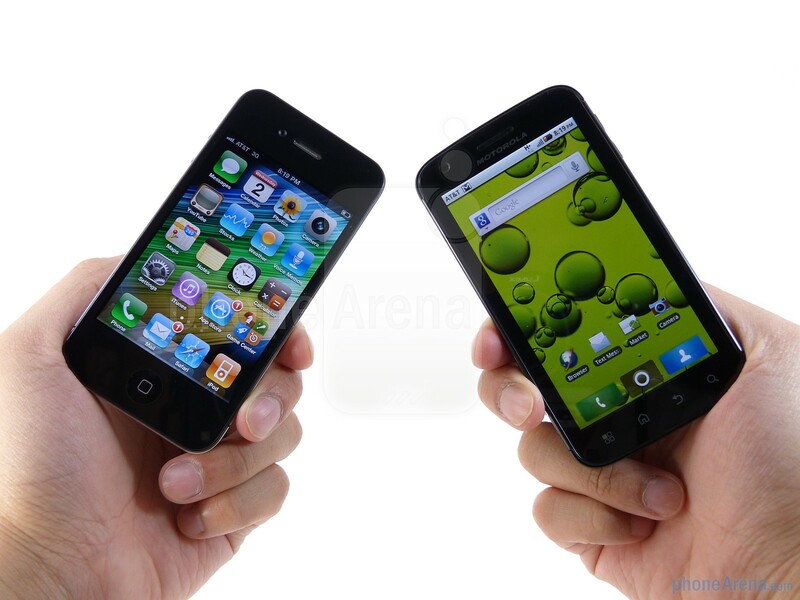 So, if you are consciously considering getting a smartphone, who do you go with? Sergey Brin’s Google, or the late Steve Job’s Apple? Both types of smartphone are strong in different areas, despite the bravado and bold claims made against each other in their advertisements. Below, we will discuss where each type of phone is strong, so that you might be able to make an educated, informed decision on what phone is best for your needs. So with out further adieu, Iphone or Android?! With the Android operating system, it is leased out to many different cellular phone companies. Some, like Samsung and LG are leaders in their field, producing world class phones. Other models, aiming to cut costs, are less durable, slower, and more prone to defects. On the other hand, the iOS runs on the iPhone only, which has long had a very high standard of quality, as it was and continues to be one of the cornerstones of the Apple brand. Another drawback of the Android phones relative to the iPhone is that the vast range of platforms that one needs to consider when cobbling together an app for the Google Play store means that some apps will perform differently on other devices, and it can even mean that some apps won’t work on certain Android phones. App developers love the iOS platform because not only to they know what to expect, and the user friendly nature of its code extends to programmers, making coding apps for iPhones a breeze, making it much more likely that an iPhone app will perform smoothly compared to its Android counterpart. Mobile gaming is becoming more popular these days, and the fractious nature of the Android universe has driven game developers to the iPhone for the reasons stated above. Another big motivator though is that Google’s insistence that most apps for Android be free, and Apple’s free-wheeling stance towards for-profit apps has led to explosion of games being available on the iPhone, compared to dearth of options for Android. While the standardization of iPhones give it distinct advantages, the multiple platforms that Android is available on allows for varying features that allow you to select a phone that is to your liking. One of these notable features are bigger screens. iPhone screens are of a respectable size, but many Android phones offer sizes up to a whopping 5.3 inches, making it easier to view online video. One of the big drawbacks to the iPhone is that is made by one company that has designed it with proprietary features, which allows them to charge an ungodly amount of money for standard repairs. The 3rd party nature of Android phones means that its parts are considerably cheaper and they are more convenient to repair than Apple products are. The economies of scale that licensing out Android’s OS to multiple companies has resulted in cheaper phones than the monopoly surrounding the iOS platform that runs on the iPhone. Another plank of Google’s strategy concerning Android is that most apps available via their Play app store are mandated to be free, allowing users to amass a large amount of the programs that they would otherwise pay for at the rate of a $1 a pop on Apple for almost no financial cost.